It was a bizarre decision to have Guy Pearce appear in Prometheus exclusively in old-aged makeup. Five years later however, this pays off in the followup, Alien: Covenant. Here, Pearce’s industrialist Peter Weyland is a younger man. He’s going grey, sure, but not shrivelled up on his way to death. In an airless prologue, we see him joust with his newest creation, the synthetic David, played again by Michael Fassbender. Having actors of this quality in a film is a godsend, and allowing Pearce to exist without pounds of distracting prosthetics, a small mercy. 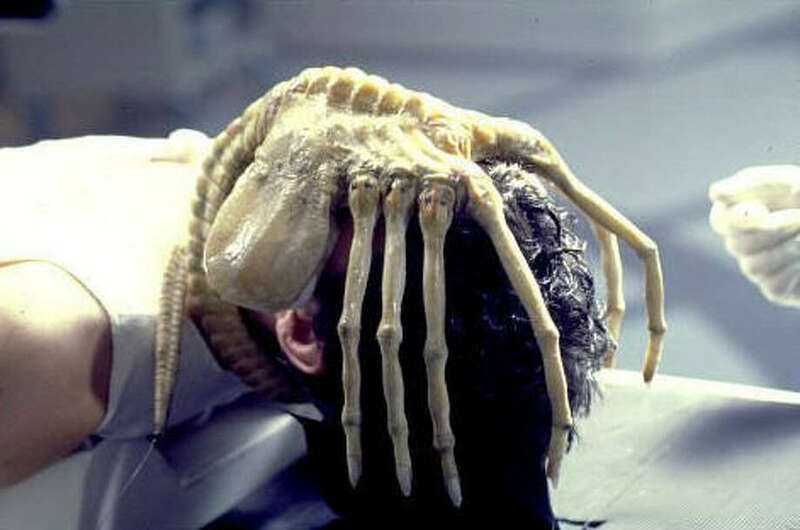 This, however, inadvertently sums up the experience of director Ridley Scott‘s latest entry to the Alien franchise. There’s a lot of beautiful work here, put together by top-notch artists, and yet Covenant plays out like one long odd choice. The talent makes it work, but it still feels unnecessary. Alien: Covenant begins in deep space. The film owes its subtitle to a colony ship filled with over 2,000 new age pioneers and crew, all frozen in cryogenic sleep, except one: the latest model of synthetic, Walter (Fassbender, again). He alone tends to the ship on its long journey to a new hospitable planet. The conditions of Earth are not made clear, but one is struck by the notion this mission is significant to humanity’s survival. (It’s there in the prologue when David remarks that Weyland will die, while he lives on.) Tragically, as tends to happen in space, minor calamity strikes and Walter is forced to wake the crew, including newly installed captain Oram (Billy Crudup, never more gaunt), first mate Daniels (Katherine Waterston, the nu-Ripley), and lead pilot Tennessee (Danny McBride, go figure), for help with damage control. During repairs, a rogue transmission from a nearby planet invites curiosity from the nervous crew, and the first of Covenant‘s, let’s say, questionable calls is made. A landing party makes its way to the surface, and surprise: more trouble ensues. That trouble is, as always, the xenomorph. As with the film’s predecessors, once this creature is let loose in Covenant, it sets about killing off the cast, one by one. The base appeal here is well-established, and Scott, along with writers John Logan and Dante Harper, revel in its horrific aspects. Large portions of Covenant feel like a classic slasher movie, with characters dumbly walking into dark caves or isolated corridors to get face-hugged or worse. There’s even a grizzly shower scene. In all, this is a bloodier movie than Prometheus — and that one had us endure a live C-section scene. Now, if that’s all there was to Covenant — crew lands on planet, meets xenomorph, gets torn apart, exeunt — we could shrug it off as a well-made genre exercise. Except, that’s not all there is to it. We can guess that immediately after Weyland starts to ruminate, or when Captain Oram breathlessly mentions his faith. Visions of gods and monsters thrum through Covenant — the film keeps insisting on it. But this narrative dichotomy only highlights the gap between the film’s ideas and their execution. Michael Fassbender one of two. While past Alien films maintain a sense of mystery, Scott now seems hellbent on trying to explain the genesis of the xenomorph and, in a reach, life across the universe. It’s funny however that Weyland shows up again in Covenant, as he almost operates as a stand-in for Scott’s own grasping search for understanding. Despite the exploding bodies and rapid gunfire, Covenant does manage to slowly immerse us into a digression on creation myths. Here is where Scott’s skills as a filmmaker are fully exercised — the scale, production design, and soundtrack, all working to envelope us in a wondrous, albeit terrifying, landscape. It’s hard to resist this embrace, even as the film’s characters, stranded by script and setting alike, keep sliding into the picture. The exception is Fassbender’s duel role as both David and Walter. His scenes — with himself! — are the most weirdly rewarding (and funny) parts of the film, which says something about the rest of Covenant‘s actual human characters. While Fassbender comes to embody both David’s idiosyncratic desires and Walter’s boundless robotic duty, it does not take the mind of a higher being to note the parallels between the film’s own competing impulses. For all of Scott’s desire to play god, he does not quite value all of his creations equally. The rest of Alien: Covenant unspools as one would expect — the xenomorph makes sure of that. While the horror of the film does have its moments, I was drawn back to the opening scene. In that prologue, Weyland tells David he is driven by the biggest question of them all: where do we come from? After a pregnant pause, we’re left to wonder. There’s an unspoken follow-up though that underlines the dissatisfaction one feels with Covenant as a whole. We can salute the film’s grand vision, praise its special effects and acting, even acknowledge some of its more exploratory or high-minded ideals, dark as they may be. But as the Alien franchise inexplicably continues, we’re still left with an enigma at the end: why are we here?